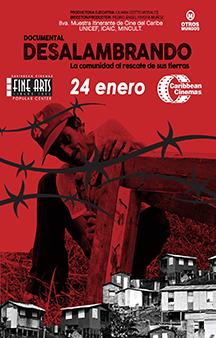 MOVIE SYNOPSIS: Based on the book Desalambrar by Liliana Cotto Morales, is a narrative about the social struggles for housing and land during the 20th century, known in Puerto Rico as rescates de terrenos, and their relevance for our present. It is contextualized within the history of the lands' appropriations from Spanish colonialism to today's coloniality pattern of the United States. Simultaneously, it is a historical document and a passionate testimony of the resilience, creativity and organizational abilities of our people in the face of adversity. The film reveals the impact on the island of social processes in the United States. The type of land seizures that it documents are a form of collective actions also found in countries of the Great Caribbean, Latin America, Africa and Asia.